Happy Birthday to our little princess Bailey! 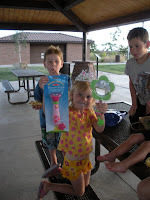 Bailey had a fun 4th Birthday. 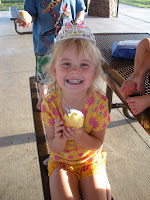 She enjoyed helping me make her "Princess" Cupcakes with purple frosting and pink sprinkles. She enjoyed eating them even more! 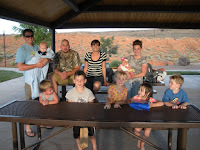 We had a fun party at the park with a few close friends. All the kids thought it was the best ever to run through the splash pad, chase bunnies, and have pizza and cupcakes! Mom and Dad thought it was the best ever that everyone was happy and there was not a huge mess to clean up after. We love our Bailey-bug! She is 4 going on 14! She is so smart and a good big sister. Some of her favorite things are anything Princess (obviously), the colors pink and purple, riding her bike, playing with friends, going to Sunbeams, snuggling, and eating "crabies". 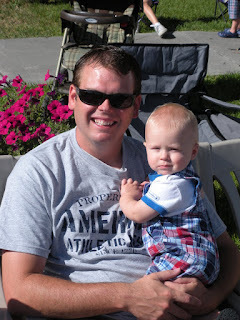 We enjoyed another great year of celebrating our country's independence and great family fun over the Fourth of July Weekend in Delta with Andy's family! 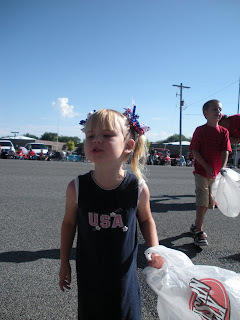 It was a blast as usual with all the great festivities; including the parade, jet fly-by, an afternoon at the "Res." on Stephen's boat (notice the hot new wake tower Andy helped him build! ), tons of delicious food, fireworks, and the first ever Hintze Games! 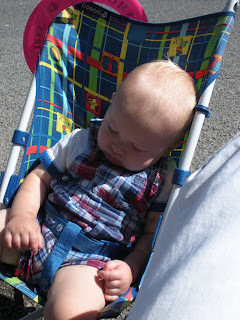 It is always a party at the Hintze house, especially on the 4th of July. We love it! We all party until we drop! Now this is what Summer is all about! 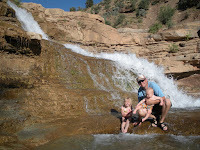 This was our fun Saturday at Toquerville Falls a while back. I had been there a couple times in college, but Andy had never gone. Some people we knew were having a party there and asked if we wanted to go. We didn't join in for their lunch, but went up later for a little adventure. As the bird flies, it is only 5 miles from the main road, but it is a very remote and narrow rocky road to get to the falls. It would have been a lot funner in the Jeep, but the kids wouldn't have done that well with that much sun and heat, so needless to say Andy wasn't that thrilled with effects on his truck. He was excited to take the family to a new and fun place though. 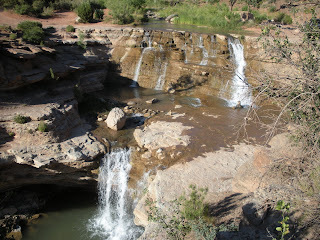 The Falls have 3 levels. 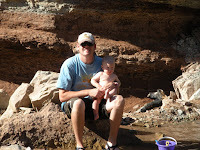 The lowest level, where it is deepest; many people were cliff jumping. 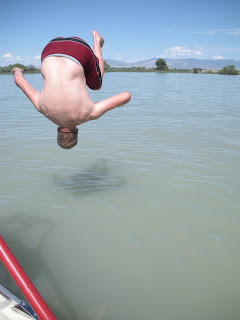 I have jumped it before, but we didn't feel the water was still high enough to risk it. It is a slow trip out if you were to break a leg or worse! 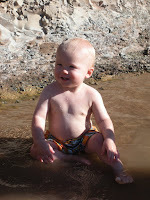 It is a fun rush when the water is higher in the Spring though. 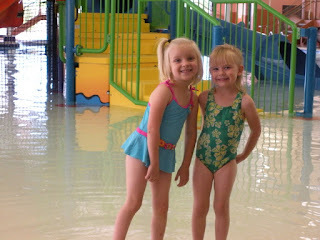 The kids had a good time splashing around in the pools and playing in the sand. On the way home we went the back way through Levirkin and Hurricane and got refreshing ice cold treats at Dairy Queen with our dinner! Andy had to go to Vegas for work last Friday to pick up some materials for work, so he brought us all along and we made a day of it! 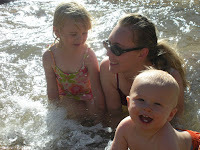 I really wanted to take the kids to the Shark Reef at Madel e Bay, but over-ruled that since we had a loaded truck and trailer. He did not want to deal with the Strip or worry about the inventory while we were where we couldn't see it for an extended amount of time. He had a good point, so I agreed. We still had a fun day though. 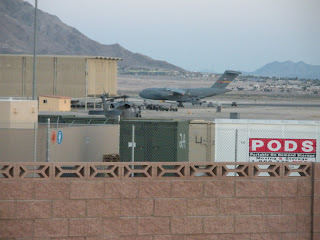 Just before the sun went down, we were heading out of town near Nellis AFB. 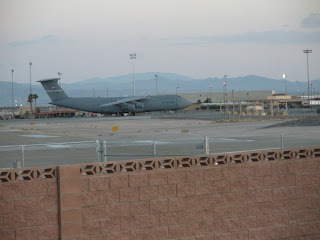 We saw this HUGE Bomber come in for a landing so we went over by the fence to get a better view. 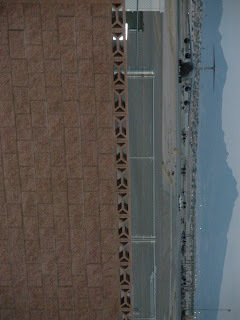 We saw it along with jets, and helicopters Which Bailey thought was really great! Hey, nothing better than cheap entertainment on the road! Look at the size of that thing! It is amazing it can ever get off the ground. Those are jets lined up behind it and a truck on the tarmack. 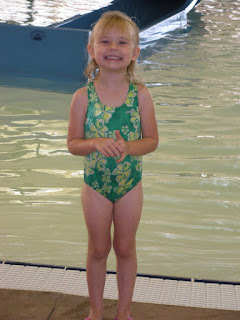 Bailey has been taking swim lessons this summer at the Community Center. So far she has loved it! I have to really prod her to get her stuff and get ready to get out the door to be there on time, but we are working on that to be ready for Pre-School in the Fall anyway; so I am hoping this will kind of get her in the habit by then. 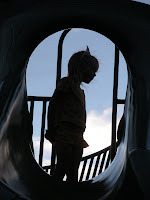 She liked seeing her friend Brookelyn each day eventhough she was in a different class. She was very excited to get her passing certificate on the last day of class! 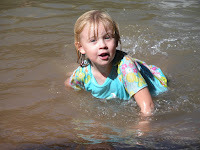 She has been very timid around the water, but with all the time we spend on the boat and at the pool and lake; swimming and being comfortable around the water is manditory. 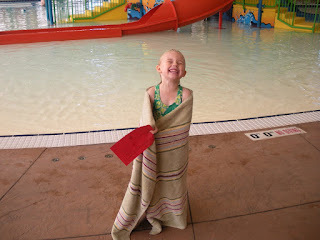 We are happy she has been doing so much better and enjoying learning. 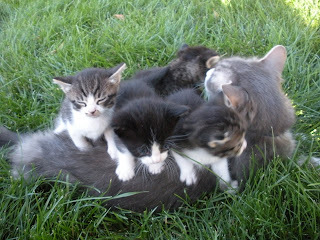 Our Peppermint "Pepper" cat had kittens! This is actually the second time she has been pregnant, but the first time; she only had one kitten and it died. After that Bailey would always pray for Pepper to have more baby kittens. Heavenly Father must have agreed, cause we got 4! We have already found a home for one of them, but the other 3 are growing like weeds and need to go! They eat way more than Pepper! Of course Andy swears she has an eating disorder, cause she will not eat any table scraps, and never totally empty's her entire bowl of cat food. She has been such a loving part of our family. 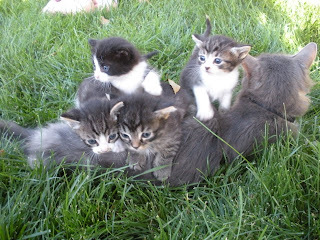 It is hard to let her kitten's go, but we can not keep them all. In the meantime, Bailey and Haden have a ton of fun playing with them! We can hardly believe it! 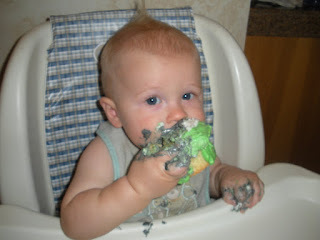 Our sweet baby boy is one year old already! Where does the time go? ... countless dirty diapers and sleepless nights, I guess! We are so happy to have Haden in our family. 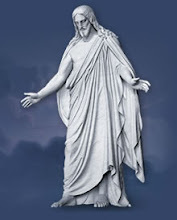 He brings us so much joy. He is so different from his sister, yet so much the same. 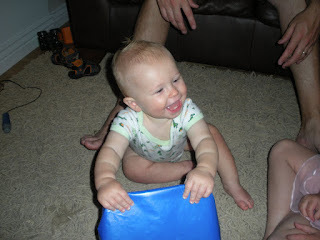 He got very excited to open his gifts when they started making noises from inside the wrapping paper. 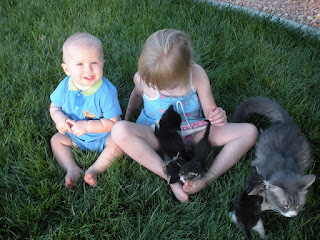 He had a lot of help from his Sister and Best Buddies, Kobe and Mae. 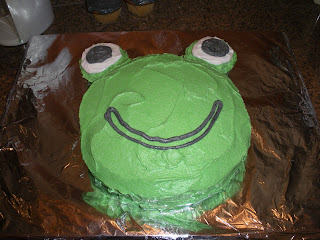 We call him our "Wide-Mouth Froggy Boy", so I made him the cute frog cake. 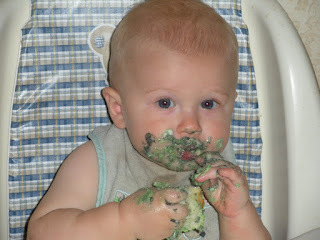 He made short work of the cupcake eyeball and soon screamed for more! The photos show his face right after, but not the color of his bum the next day! It was fun time. Happy Birthday Baby Boy! We love you!